725.35 meters. A whoppumental 2,379.75 feet. That's how big the new super-sized Enterprise is. Here you can see it compared against the Galactica, the good old Enterprise, the Blockade Runner, and the ISS. When JJ Abrams said that he wanted to put some Star Wars into Star Trek, apparently it also applied to the scale of spaceships. 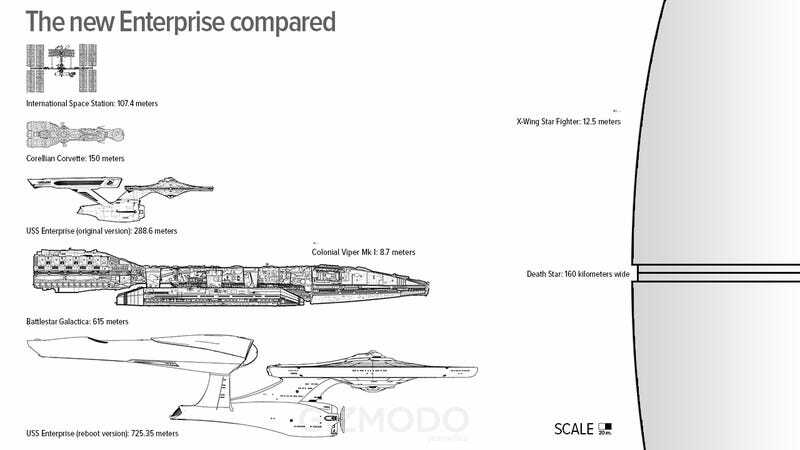 And while the new Enterprise doesn't even reach half of the 1,600 meters—that's a mile long—of an Imperial Star Destroyer, it's still amazingly big compared to the 288 meters of the old Enterprise. Maybe now you would be able to take down an Star Destroyer with a couple of these. How much would it cost to build this thing today? This much.